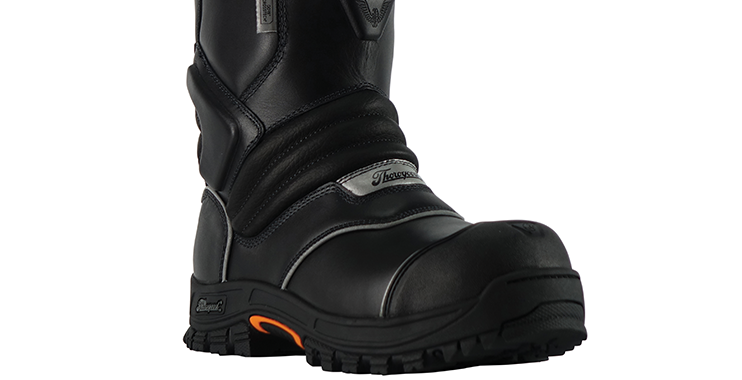 Thorogood’s new QR14 bunker boots are built for comfort, durability and safety. The flex gussets allow the boot to move with you. 3M™ Scotchlite Hi-Vis piping in these waterproof, flame- and cut-resisting leather bunker boots creates a high-visibilty look when exposed to direct light. The aggressive, slipresisitng outsole with 90 degree heel and ladder grips provide exceptional traction on any surface. GORE® CROSSTECH® triple layer moisture barrier is the toughest in the industry, delivering rugged, longlasting protection that exceeds the requirements of the NFPA 1971 standard. The composite safety toe, Lenzi L-Protection® insole, and steel triple-rib ladder shank protects your foot from impact, puncture, and the strain of working on ladders. Extra padding in the shin and ankle protects you from ladder rungs and other impacts. Slip-resistant in all conditions and heat-resistant when the going gets hot, these all-weather boots don’t quit until you do.